The following article by playwright Dean Parker appeared in the Sunday Star-Times on 31 March (http://www.stuff.co.nz/entertainment/arts/8478959/The-Kiwi-and-the-Kremlin). In 1949 the First Secretary at the New Zealand Legation in Moscow, Paddy Costello, was visiting the Russian poet (and subsequent author of Doctor Zhivago) Boris Pasternak when Pasternak was called away to the phone. Paddy Costello sounds a corker bloke. Born 1912, raised in a grocery in Ponsonby not far from where I live, then on to Auckland Grammar and Auckland Uni, brilliant linguist and classicist (described by the Auckland University Department of Classics and Ancient History as “probably the most brilliant linguist ever in the department”), scholarship to Cambridge 1932, joined Communist Party 1935, met and within three weeks married fellow comrade Bella Lerner, Long Range Desert Group during the war, right-hand man to General Freyberg, renowned for pitch-perfect ballads sung at booze-ups, career diplomat until 1954, then let go after suspicion of being a Soviet agent. Died 1964 (heart attack). A quick and sensational life. What stands out, of course, is suspicion of being a Soviet agent. In 1954 two atom bomb spies working for the Russians arrived in Paris from the United States and were issued with New Zealand passports under the false names Peter and Helen Kroger. This enabled them to enter Britain and set up shop until arrested in 1961. When The Mitrokhin Archive—a cache of documents smuggled out of Russia by a senior officer of the Soviet Foreign Intelligence service—was published in 1999, it revealed that a list of the Paris KGB’s “particularly valuable agents” in 1953 included an agent at the New Zealand consulate code-named “LONG”. This was 6ft 2in Paddy Costello whom, the Archive claimed, issued the Krogers with their Kiwi passports. McLeish’s biography coolly and forensically demolishes the claim that Costello issued the Krogers’ passports. The passport applications were taken by another member of the consulate, Doug Zohrab, and signed off by the Charge d’Affaires, Jean McKenzie. Of course proving that Paddy Costello had no hand in the issuing of the Krogers’ passports is one thing, proving that he wasn’t a Soviet agent code-named LONG entirely another. The term “agent” presumably covered a multitude of dealings. Costello had an Irish background, learnt Irish, would have seen the union jack as a butcher’s apron and the Empire a racket where Britain waived the rules, would have had no compunction in passing on to anyone anything and everything he was privy to about London’s continued meddling in, say, the Middle East pre-Suez. I would have done the same. But look, honestly, he loved his family, admired and was loyal (in his own way) to his wife, didn’t exploit or oppress anyone, liked a drop and sang at parties. He was “unforgettably good company” according to his mate and fellow son of Irish immigrants, the wonderful Southland novelist and short story writer Dan Davin, “an unscrupulous arguer, the subject of countless stories, a man who could make any occasion come alive.” Who cares if he was a Russian spy? I’ve noticed women don’t. Women have a much more honest and personal view of what constitutes treachery. It’s only blokes who carry on about whether or not he was a spy. When I wrote Midnight In Moscow (opening at the Maidment Theatre in Auckland in April, then in a second production at Circa in Wellington in May), I had Paddy Costello in mind as I fashioned one of the characters, Hugh Toomey. 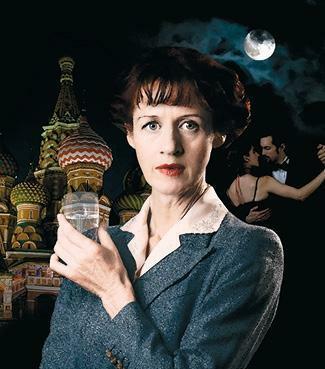 The play takes place in the Russian capital in 1947, right at the onset of the cold war. It’s a play of four acts, standard Chekhov. Three of the acts are set inside the New Zealand Legation where there’s a line-up of entertaining and hard-drinking figures from the foreign service. The remaining act, occurring in the first half, is set among the pine trees and cucumber patch of Boris Pasternak’s dacha in Peredelkino, a leafy riverside retreat outside Moscow. There Hugh Toomey, Second Secretary at the Legation, makes regular visits to argue politics and literature with Pasternak… just like Paddy Costello. When he was stationed in Moscow, Costello edited a volume of 20th century Russian poetry published by the Oxford University Press. He regularly met up with Boris Pasternak. Like Costello, Hugh has been asked by Pasternak to do the English translation of the novel he is working on, Doctor Zhivago, a novel which portrayed the devastation wrought on Russia following the 1917 revolution and which will eventually win Pasternak the Nobel prize for literature and prove a major humiliation for the Soviets in the cold war. But Hugh dislikes what he has seen of Zhivago. And in the play these are the arguments we hear from Hugh. And again in the play the phone rings and it’s Stalin calling for Pasternak. But this time it’s not the call that Pasternak recounted to Costello, the call about poetic advice; “Stalin needs an envoi for his latest sonnet,” might have got an easy laugh but I could see no real pay-off in terms of where the play was taking me. So I changed it. I changed it to an earlier call that Stalin made Pasternak. A more lethal call. In 1934 Lenin had been dead for 10 years and the Soviet Union was in the glacial grip of Stalin. The Party had replaced the people, and the General Secretary the Party. Moscow had become a place of the chill midnight tap on the door. On an evening in June that year Stalin rang Pasternak and asked if he thought the poet Osip Mandelstam was a genius as Mandelstam had just been arrested and “the Soviet Union does not arrest geniuses.” We know from various reported accounts that Pasternak rambled on about how Mandelstam was from a different school of writing to himself but then straightened up and said he needed to talk to Stalin “about love, about life, about death”. Stalin went silent, then said something along the lines of, “If it was me getting arrested, I’d hope my friends would stick up for me better.” And hung up. And fair enough. This was the phone call I used in the play, because I thought it gives a better insight into Pasternak, his little vanities and delusions. Gives an insight into pretty much all writers, really. Costello’s life was compromised by Stalinism. He failed to see Russia’s revolution had changed in its class base and character, and carried on as a Stalinist cheer-leader. But Pasternak was compromised as well. He had supported the revolution in 1917, lost his faith to a considerable degree in the ’20s but seemed to believe that all that was needed in the post-revolutionary ’30s was some sort of guidance in spiritual values from the top. When that proved impossible, or mistaken, he retreated into art and mystical pronouncements on life and love. What was needed was a different debate about how we are to live. Hence the play. Midnight In Moscow, Maidment Theatre 11 Apr – 4 May, directed by Colin McColl; Circa Theatre 11 May – 8 June, directed by Susan Wilson. To book for the Circa season, visit www.circa.co.nz or vall 801-7992.